One of my personal favourite lead guitar techniques is something I like to called sweep-tapped arpeggios. By this, I mean you sweep pick an ascending arpeggio and then tap an extra note higher in pitch with your right hand. It creates a very smooth, fluid, and piano-like effect. I think they sound pretty cool! In the key of B, I’ve notated the major and minor versions of a basic arpeggio shape using this sweep-tap technique. Although you can use any arpeggio shape, I’ve found that this one is the easiest, and so it’s a good place to start. Starting on the fifth string, use the one continuous right hand downward pick stroke while fretting the left hand notes – slightly releasing the pressure after each note is played. When you get to the first string, hammer-on with your left hand, and then slightly move your right hand towards the fretboard and tap the next note with your right hand middle finger (the 19th fret octave in this case). You then pull-off your right hand middle finger (by slightly flicking it downwards) into a left hand pull-off. Move your right hand back into position and then perform an upwards sweep, finishing where you started on the root note. Start slow and work on the coordination of both hands before trying to build up the speed. In the key of E minor, here I’ve taken the basic major/minor shapes from the previous exercise and applied them to a Im-Vm-VII-IV-VI-III-VI-VII-Im chord progression. This involves quite a bit of jumping around the fretboard, so once again start off slow and work on staying in time. 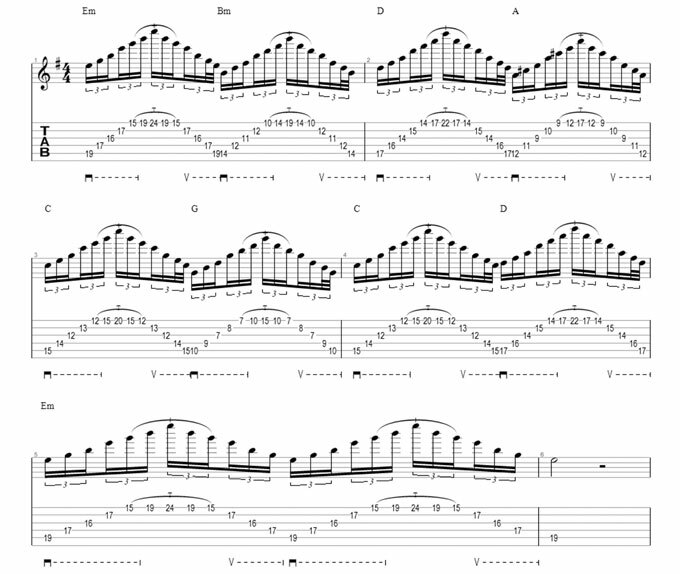 For some of the arpeggios further down the fretboard, you may find that you need to sweep pick in a diagonal motion (towards the neck as you ascend and away from the neck as you descend). This is so that you have time to reach the tapped note. Keep in mind that this is just an exercise – in a more musical context you should be careful not to overdo it with this sweep-tap technique! Give these sweep-tapped arpeggios a go for yourself and try incorporating the technique into your own solos. 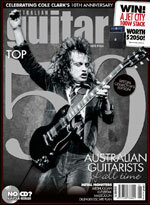 You can hear the exercises at www.australianguitarmag.com.au.